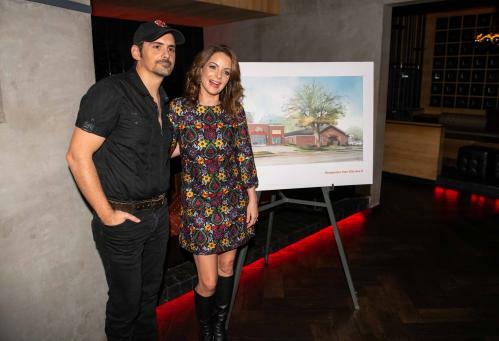 Brad Paisley and Kimberly Williams-Paisley, in association with Belmont University, are excited to announce they are spearheading a unique and new non-profit for the Nashville area. The Store will operate as a free referral-based grocery store, allowing people in need to shop with dignity for their basic needs. It aims to empower individuals seeking self-sufficiency. The Store is inspired by the Unity Shoppe, located in Santa Barbara, CA, where the Paisleys spend some of their time. After working in the shop, they saw first-hand the impact it has on people, including the volunteers. The Paisleys have partnered with Brad’s alma mater, Belmont University, on the location of The Store at 2005 12th Ave. South, next to the University’s Ministry Center. In 2018-19, Belmont will be piloting Healthcare and Legal Aid Ministry Clinics. Both groups look forward to working closely together to serve the broader community in a range of ways. The location is convenient to bus routes and in the heart of Nashville’s ever-growing 12 South district. The Store will partner with Second Harvest Food Bank of Middle Tennessee and others to provide perishable and nonperishable offerings. All food in The Store will follow guidelines set by dieticians from Second Harvest Food Bank. Individuals and families will be referred by nonprofit and government agencies for a term of one year. The initial goal is to serve 3,000 people per year. Nashville-based architectural firm ESa (Earl Swensson Associates) has donated their services to design The Store. Ground breaking is projected for 2019. The “Brick By Brick Campaign” will raise funds for construction of the storefront and establish enough funding to meet the proposed operational needs for food. The goal is to have $500,000 before groundbreaking with a total construction target of $1.2 million. The Paisleys announced on Tuesday that they will be donating an initial gift to kick off the capital campaign. Donations are accepted via the website at www.thestore.org. “If a major donor would like to partner and help us fund the building, we would be honored to put their name in bold letters at the top of it,” says Paisley. The Board of Trustees for The Store include Brad Paisley, President; Megan Zarling, Chair; Pete Fisher, Vice-Chair; Doug Paisley, Secretary and Elaine Bryan, Treasurer. Other board members include Sarah Cates, Jaynee Day, Hope Fisher, David Minnigan, John Zarling, Olivia Munn, John Schario, Scott Scovill, Michael Stagg, Becca Stevens and Kimberly Williams-Paisley. Executive Director is Gina Hancock.